That a disagreement between the IMF and the other members of the Troika negotiating with Greece should have become public may seem surprising. That it appears to be about whether Greek government debt to GDP should fall to 120% by 2020 or instead by 2022 seems stranger still. Most observers probably think either is wishful thinking. However one interpretation of this disagreement is that it signals the IMF is beginning to accept that the Troika’s previous strategy of ‘squeeze and hope’ has not worked, but European governments and institutions are still refusing to recognise that reality. At the outset it is essential to acknowledge that Greek governments in the years before the recession behaved very badly in both economic and political terms. As a result, when the recession hit, the Greek government’s finances became untenable, and partial default eventually occurred in 2012. However, as part of the crisis that began in 2010 as well as this default, the ownership of claims on the Greek government gradually transferred from the private sector to other European governments, the ECB and the IMF: collectively the Troika. This transfer is generally portrayed in the media as other governments ‘bailing out’ Greece. However at no point has any institution given away anything. New loans to Greece have been at various interest rates: from 5% from the ECB, around 3.7% from the IMF, and from the ESFS/ESM at starter rates of 2% rising to 3.5%. (For these and other details, see a comprehensive new paper by Zsolt Darvas from Bruegel.) Nevertheless these loans enabled Greece avoid the even sharper contraction in fiscal policy and output that would have occurred if there had been complete default. We can see this by looking at the primary balance in the table below. This is the difference between government spending and tax receipts before any interest on debt is paid. With complete default and no further loans of any kind, a primary deficit is not possible, so in 2010 the Greek government would have to have found additional revenue or cuts (i.e. beyond those it actually made) worth 4.7% of GDP. In these circumstances it is quite understandable why the Greek government did not want a complete default, and the loans from Europe and the IMF helped them avoid that. Whether European governments were wise to make these loans, and initially resist any default on private debt, is another matter (see Danielsson and Buiter for example.). Part of the problem may have been that they were acting in their own (or their banks) interests in insisting this was a European problem rather than an IMF problem. Nevertheless, once they did this, as creditors they took responsibility for subsequent events. The figure below is taken from the Darvas paper. 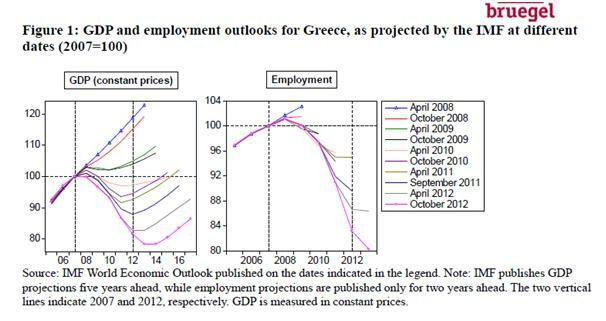 It shows how IMF forecasts for Greek GDP have been substantially revised down each and every year since 2008. Initially of course this was as a result of the global recession. But in more recent years it is in large part a result of underestimating the impact of the austerity that was imposed on Greece as conditions for the loans. It is now abundantly clear that as a result of these misjudgements the Troika overestimated the amount that the Greek government could pay. (In an interesting analysis, Ardagna and Caselli (pdf) draw a sharp contrast between the agreements of 2010 and 2011. They suggest that while the austerity required of Greece in the first was feasible, the additional austerity in the 2011 agreement was not.) Just as private sector lenders to the Greek government made a misjudgement, and had to suffer loses, the same now appears to be the case for the European governments and institutions that took their place. The IMF appears to recognise this, but European governments do not. They want all their money back. However the situation has changed as a result of the excessively harsh austerity programme. It may be bringing ruin to the Greek economy, but the primary surplus is now near balance. The Greek government’s position is no longer unsustainable because it is spending more than it is receiving in taxes. It is unsustainable because it cannot afford to pay the interest on its debts. The additional borrowing the Greek government currently needs will mainly head straight back from where it came, as interest on existing debt. As a result, the Greek government could now decide that it is better off defaulting on its debt, or as the opposition party Syriza threatened to do, suspend all interest payments on that debt. In normal circumstances, this would mean the creditors position was very weak, and they would be forced to negotiate some sort of managed default. But this is where things got ugly this year. The Greek people were in effect told that they had to pay back these loans under the conditions specified if they wanted to stay in the Eurozone. At first sight it might seem strange to suggest that Greece could stay in the Eurozone if it defaulted on its loans from the ECB or ESFS. Surely Greece would have reneged on its agreements with these countries? This goes to the heart of a misconception about the morality of loan agreements between countries. No one forced those outside Greece to lend them money. Any loan always comes with some risk of default. Now if someone defaults on a loan, you might think twice about lending to them again. You might also avoid doing business with them if you felt they had been duplicitous in some way. But in this case default would have occurred because the Greek people understandably felt that they did not want to destroy a quarter of their economy in a doomed attempt to maintain interest payments. This is hardly duplicitous behaviour. This is why I have always stressed the importance of looking at the cyclically adjusted primary balance. It gives you a good indication of the extent to which the government is trying to put its fiscal house in order. The way I read these figures is that the Greek government is trying much harder than it should, and what is happening to GDP corroborates that. That this is still not enough is a problem for those that made these loans with these conditions, and not some collective crime of the Greek people. So what should be happening now is that the Troika collectively admits it got things seriously wrong, and it therefore needs to cut its losses. It is in the best interests of all concerned that the amount and terms of the loans are renegotiated with the aim of getting as rapid and certain a recovery in the Greek economy as possible. Unfortunately politicians are not very good at admitting mistakes, particularly as this involves questioning the wisdom of austerity. They want their money back, and continue to hope that their old strategy of ‘squeeze and hope’ will come good. So austerity is intensified, and the downward spiral of the Greek economy continues. In a previous post I described this motivation for austerity as a ‘destroyer of worlds’, which might sound emotive to some, but probably not if you are living in Greece right now. The OECD suggest that 'wages' fell by 3% in 2010 and 2011 in Greece, and are expected to fall by at least as much this year and next. Devaluation may be a better way to correct competitiveness, but is it the only way? As the majority of Greeks seem to want to remain in the Euro, should we not respect that wish? Destructive economic policies aside, is there a bigger political thing here of Greece being treated in a way that encourages others (e.g. Ireland or Portugal) to ask for as little "assistance" as possible and everyone else to behave as "appropriately" as possible (as defined by the troika)? And, ignoring how politicians feel about u-turns, does the treatment of Greece compared with say Spain reflect the former's relative lack of political clout? In an earlier post, you said something along the lines that Keynesianism was about real interest rates unable to balance the economy. Well, I would strongly advise to look in that direction. Nominal interest rates for households and businesses are around 7% in Greece. Inflation expectations? I would say zero at best. Thus, real interest rates of 7% or more. Who in his right mind can believe that the Greek economy can do anything else but shrink with such high real interest rates ? The problem is not budgetary, it is monetary. But why are interest rates at 7%, when ECB rates are less than 1%? I could also add who in Greece would borrow in Euro when there is the possibility that they might get thrown out of the Eurozone. This threat was all about getting their money back, and it did great harm to the Greek economy. Well, it is obvious and visible across much of the Euro Area: the ECB is not making much effort to get its monetary policy transmitted. We could go into more detail, discuss capital flight etc, but that is the bottom line. The ECB is simply a failed institution. If potential private borrowers were scared to borrow because of a potential exit from the Euro, interest rates would have no reason to be high. No, it is because capital flight has starved Greek banks of liquidity and private loan is behaving normally that interest rates are so high. And capital flight really took flight when the default option was put on the table, well before any talk of Euro exit. Logical in fact: who would leave his savings in a bank whose sovereign is about to default? I think the default has aggravated everything because it has massively aggravated monetary conditions in Greece. It is not a track I would pursue further, at least not with regard to non-official holders of Greek public debt. "No, it is because capital flight has starved Greek banks of liquidity and private loan is behaving normally that interest rates are so high." Like other banks, Greek banks can create money out of thin air and the ECB will provide them with reserves afterwards. There must be another problem. Greece, among other things, needs more European cohesion funds. This is also what saved the Baltics (in combination with welperforming Nordic export markets). Take Estonia for example. In 2011 it received grants worth 7,7% of GDP. In 2006 (in 2011 Estonian GDP was more or less on the same level as in 2011) Estonia received grants worth 2,8% of GDP. I don't understand why almost no one paid attention to this factor in the recent debate between Krugman and others about the 'succes' of the Baltics. It clearly disproves that the Baltics started growing again because of 'austerity'. Jan - interesting point. To save me time, can you point me to a source for the cohesion fund information? In the document for 2010 you can see that the amount of 'subsidies' has doubled in 2009 compared with 2008. Would you also conclude, based on this information, that EU transfers played a non-negligible role in supporting the economies of the Baltic states? Should the Eurozone’s fiscal rules be abolished? Disengagement at the Bank of England?